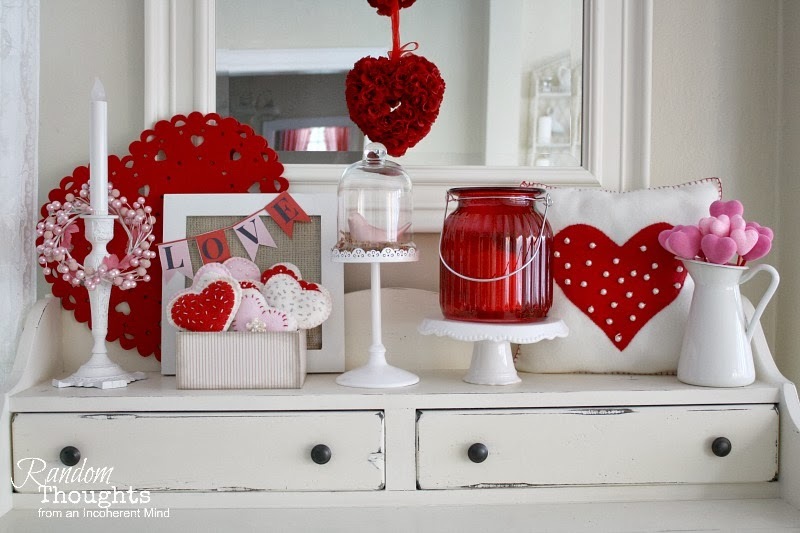 I wanted to leave you with a Valentine's Day vignette. My dining room hutch is always a favorite place to decorate. my kitchen from the back door. For that reason, I love to make it attention-worthy. It all came together pretty quickly. I didn't need to run out and buy anything new. I love it when that happens, too! and the fleece hearts I made a few years ago. way to use them each year. I should make more of them because I really do love them! 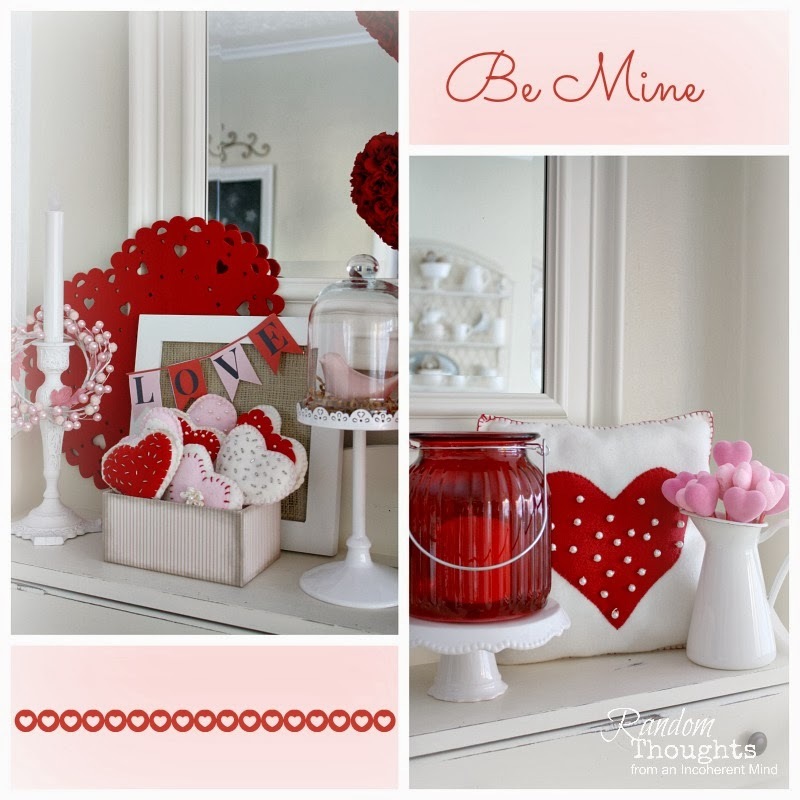 my first Valentine's Day vignette of 2014. Beautiful! Love the not needing to buy anything part. 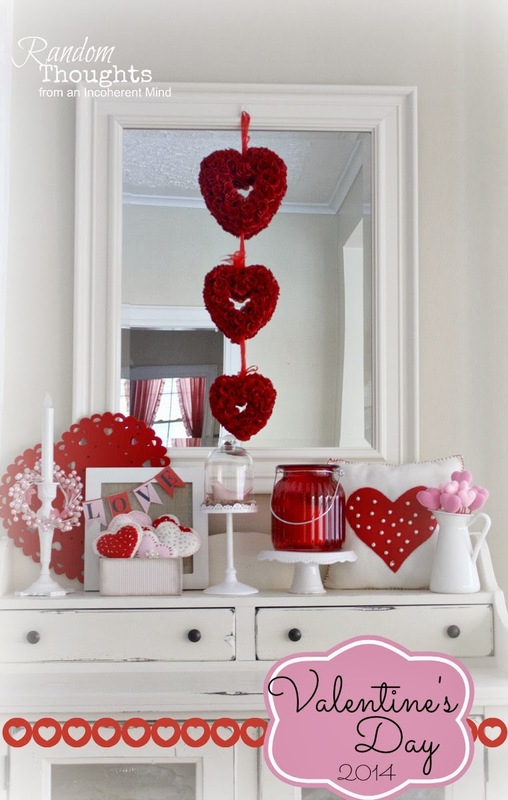 I am working on my Valentines decor and will probably need to buy some things! I love the felt hearts Gina, I did my mantle with what I had and that was great. Very pretty and cute. I need to do mine and hopefully won't buy anything either! 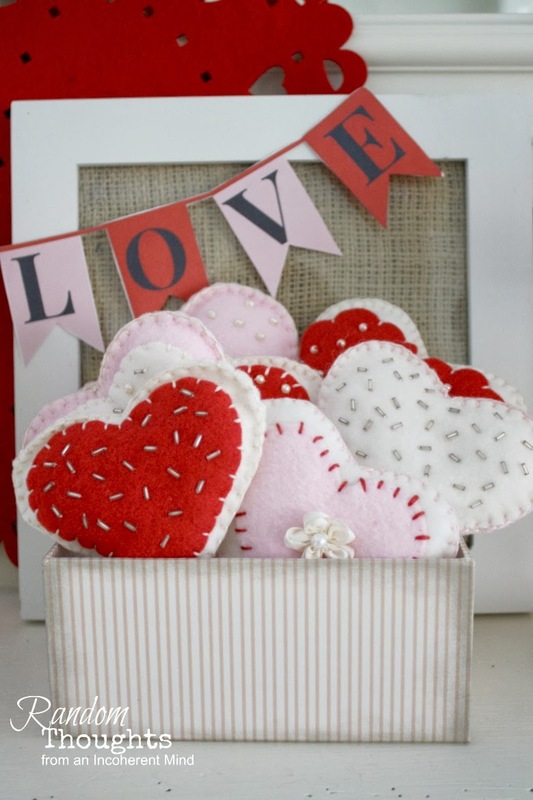 That's beautiful, and love the felt hearts.....they look like sugar cookies!!! It looks great. All I have up is the heart cut out that I posted today. Your hearts remind me of the last two heart swaps I hosted. Love them. I need to get my hearts out of storage. Happy Valentines Day. Perfect!! Gina I love all the hearts!! O, how pretty this is, Gina. With all those beautiful red and whites, I can see why you didn't have to buy anything to make it all come together. The little white box full of hearts is precious. I just started making a few Valentine things. I promised my family no Valentine decor until February 1. It all looks so happy and cheerful! Love the little felt hearts! Cute, cute, cute!! I love it!! Very cheery! very sweet, and love all the red. so cheery! I love every little detail here. The red and white are so happy! 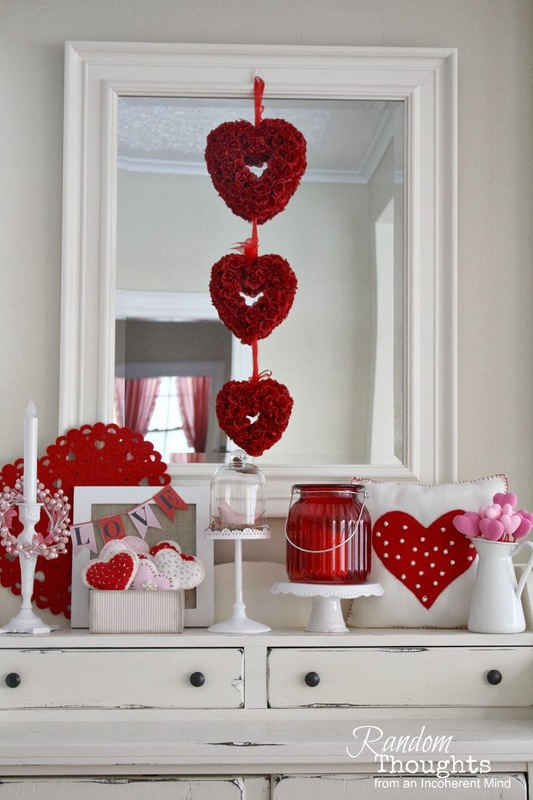 You're Valentine Vignette is a "Welcome Home" to all of us! You are correct, Gina! What the world needs is more of those cute little "SweetHeartHugs! So pretty Gina! You can't go wrong with the red and whites. 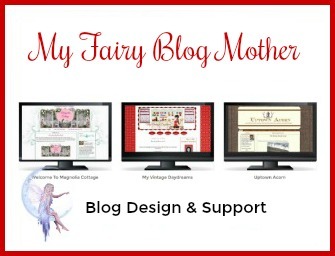 Notice my URL has changed, I'd love if you'd pop over and follow me at my new address. Thanks friend. Ahhh I knew you would be all decked out for Valentines day. So pretty Gina! I want a slice of peanut butter pie, and I have to tell ya that I think your little homespun hearts are so flipping' cute! LOVE them, and I love the bright red of your vignette next to the winter white. Every pic is Pinterest or magazine perfect, Gina! And how on earth did I miss your peanut butter pie recipe earlier? It is my favorite hands down - oh my gosh goodness in every bite. 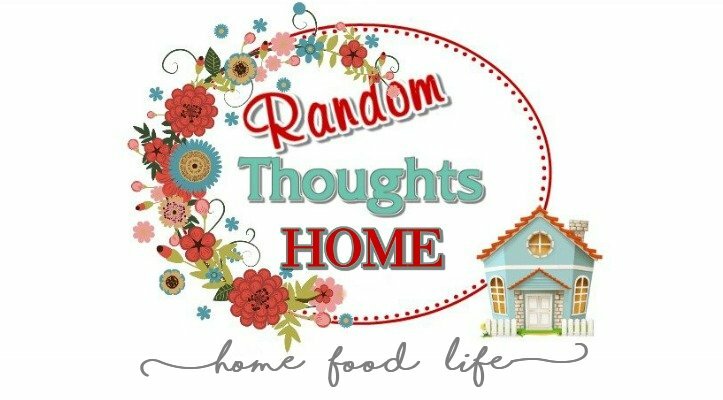 Thanks for the inspiration, hon! !